This week we are learning about Matariki. Matariki is the Māori New Year. It takes its name from the seven star constellation which reappears over the horizon during the Winter Solstice (usually late May or June). In Western astronomy this constellation is called The Pleiades. Traditionally, Matariki is a good time to plant trees, prepare land for planting crops and get back in touch with whānau. The New Year is also a good time to reflect on your place in the world, to try out old skills or develop new ones, and to set new goals. Matariki is a time for making things. It is a time to gather with friends and family. Today we got together with our buddy class A7 to celebrate Matariki. 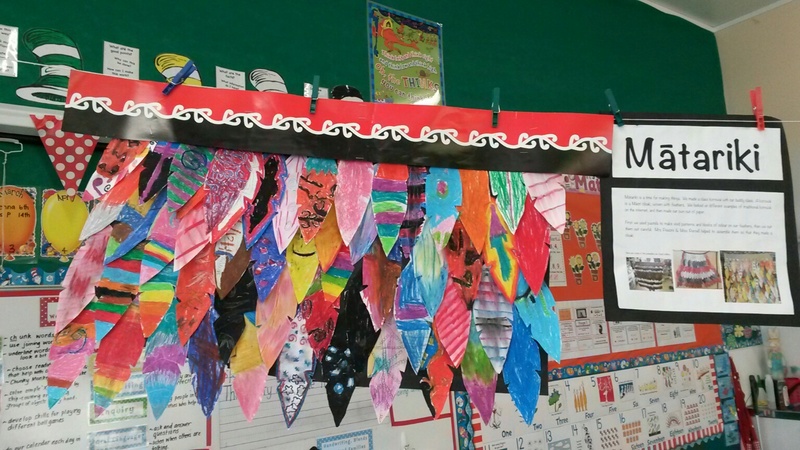 We made a class korowāi with our buddies. A korowāi is a Māori cloak, woven with feathers. We looked at different examples of traditional korowāi on the internet, and then made our own out of paper. We used pastels to make vivid patterns and blocks of colour on our feathers, then we carefully cut them out. Then we assembled them so that they made a cloak. We are very proud of our korowāi. It is displayed in our classroom.